I remember a case I worked that involved a couple of fellas who had won a big-buck archery contest with a very nice 10-point trophy. They had entered the contest fair enough, but when a competing contestant happened to meet them driving away from a hunting area during morning’s first light, things didn’t add up correctly; they were transporting a field-dressed trophy deer. How could they have shot, recovered, field dressed and loaded a deer, and be on their way out so quickly? Disappointing to me, the other contestant might not have raised his suspicions had it not been for the first place prize – a shoulder-mount – that he knew was spoken for, due to the size of the deer. This day and age, hunters are competing to win trucks, ATVs and all sorts of big-dollar prizes. If a couple of hunting buddies will poach for a $350 shoulder-mount, what length would some be willing to go to for even greater fame and fortune? While on an elk hunt in New Mexico, I was reminded of this case because I too recently experienced some pressure to succeed. My return, the week before, with empty ice chests from a Nebraska hunt had caught the attention of some younger peers … their teasing hit a nerve. On the Nebraska hunt, I missed a chance at a decent speed-goat, passed on a smaller one as well as a couple of small deer. When I arrived in New Mexico, I was showing photos of our five-star accommodations in Nebraska. That’s when a couple of warden buddies alleged that my hunting partner and I were just honeymooning. But then came along the blow that hit below the belt. Another warden humorously declared that my hunting photo album looked more like it belonged to a PETA member than a hunter. Those innocent jabs, seemingly without standards, were a little hurtful. Why? They caused this old warden to hesitate and ponder: Am I getting soft? Can I still succeed? Can I still win in my competition with nature? Having the right to hunt, spending time with hunting buddies, and harvesting an animal once in a while should be ample satisfaction. Stories of victories and success sometimes get delivered with an extra dose of pride when lauded by peers after a successful hunt. The problem is our world has become so competitive that even a modest prize can steer people in the wrong direction of winning at any cost. If we will address our temptation to “win and succeed no matter what” before the opportunity presents itself, we ultimately will feel better about ourselves and stay away from possible violations. I've always been a competitive person and like to win as much as the next guy, but winning shouldn’t be at the cost of losing sight of our hunting heritage and why we hunt. The desire to win and succeed can be intoxicating; we all have to be ready when we’re face to face with a potential bad decision. In the case of the two hunters that won the big-buck archery contest, they had done everything right as they headed out with bows two hours before daylight. But when a big 10-point followed a hot doe crossing the road in front of their headlights, the driver suddenly remembered his recently inherited family heirloom .270 rifle, that just happened to be stored behind the seat. His partner, somehow, knew to instantly grab the plug-in spotlight to "just look at the nice deer." No need go on; you know what happened next. Hunting in pairs is not uncommon; it’s a social sport that is often more enjoyable with family and friends. However, when you add a spotlight and a high-power rifle to a pair of hunters during archery season, the intent becomes obvious. 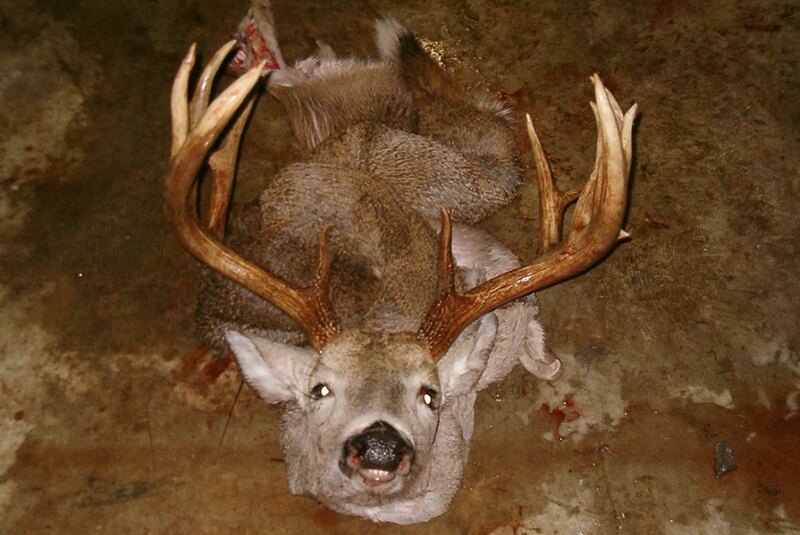 Once it was made public that the big 10-point was the winner, the contestant, that passed the violators on a road, turned in a statement for what he had witnessed. After getting verbal confessions from both hunters, and it took a while, I was reading through their written statements and found a very interesting twist to the whole story. Apparently, an hour after they poached the 10-point buck, while basking in the glory of their accomplishment from the cab of a warm truck, they had an opportunity to kill two more bucks. The statement read: "It was getting light when we spotted two 180-inch booners fighting in a nearby wheat field. That's when I realized I had left my wife's rifle back in those woods!" Luckily the two giant deer were gone by the time the duo had retrieved their “.270 caliber arrows.” Not only did they spotlight and kill a deer out of season, they would have tried to kill two more. The seized .270 rifle nearly caused a divorce because the wife struggled with the truth and how such a wonderful husband and father could do such a thing. She even called me once, suggesting that I had framed her husband, just to make a case. A couple years later while I was working some consumer hunting shows, I happen to meet up again with both violators. At one event, the “shooter” approached and shook my hand, thanking me and saying the stressful situation had forced him to re-evaluate many aspects of his life. He had learned from the experience and it helped him to correct a number of bad behaviors. During another event, the “light man” emerged from a crowd that was standing in front of our warden booth watching decoy-deer videos. The table at our booth displayed a pile of antlers confiscated by various wardens from around the area. The man had a young boy with him who watched the video as his dad smiled and extended his hand. We shook hands, and then he proudly pulled up his shirt sleeve revealing a decent-looking white-tailed buck tattoo on his shoulder. He blurted out, "I never want to forget that whole thing!"